After years of wanting to give it a try, I jumped at the chance to have my DNA tested when my mother offered to order a kit for me as a Christmas present. I chose Ancestry DNA because it is the service used by my in-laws as well as a great uncle. Ancestry is currently running a deal where the kits are 79 dollars instead of 99. Please be aware there is around a 8 dollar shipping cost. Bonus: If you are a member of Ebates you can also receive 7.5% cash back on any Ancestry product! 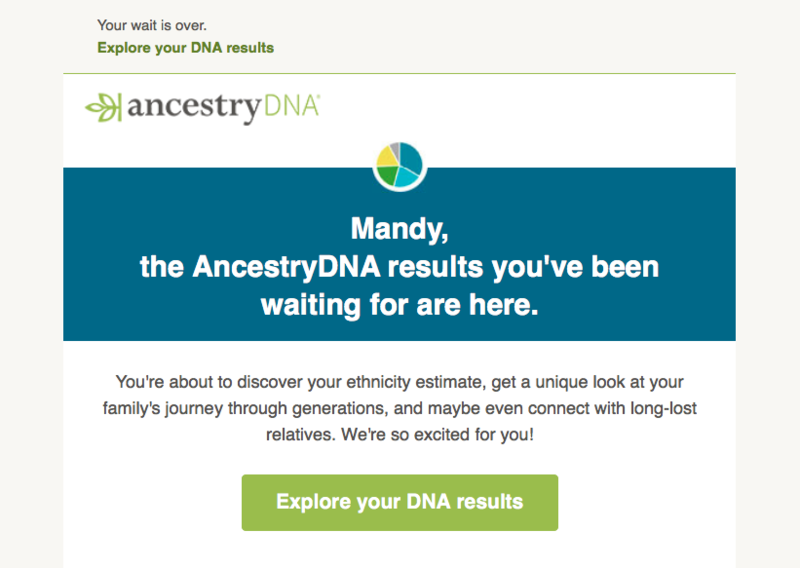 Anyway, I was curious to see how my genealogy research has stacked up to the realty of my own DNA. So I would like to take this moment to walk you through the process from beginning to the reveal! 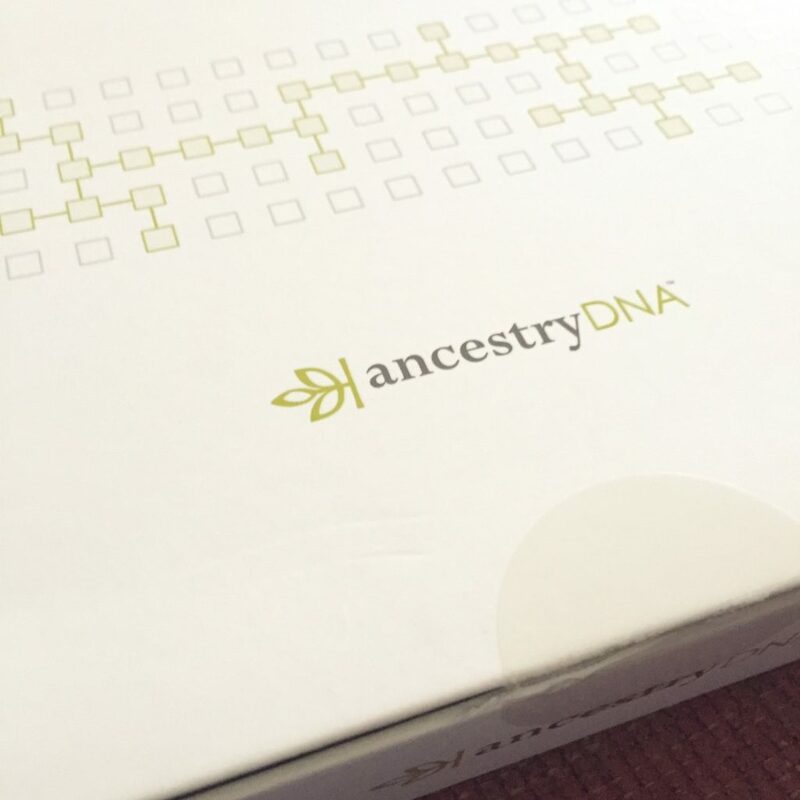 Ordering a kit is a simple process where you create an Ancestry account, and place the order with payment. It took less than a week or a small box to arrive. (Photographed above.) It is the size of a small VHS box, and fits easily into the mailbox. The kit includes two tubes, a prepaid mailer box, and clear instructions on how to complete the test. You cannot eat, drink, or chew gum up to thirty minutes before collecting saliva. You have to spit into the clear tube. (They claim its only 1/4 of a teaspoon, but I had difficulty getting the tube filled!) You then place the blue tube on top and shake in the blue stabilizing fluid. This step preserves the DNA. Make sure to register your kit before sending in your results! There is no need to go to the post office desk. You can drop it in the mailbox since it is pre-paid. I ordered the kit on November 5th, received my kit on November 10th, sent it out the next day. My results arrived on November 23rd. The whole process took 19 days! Ancestry does say give 4-6 weeks for processing. 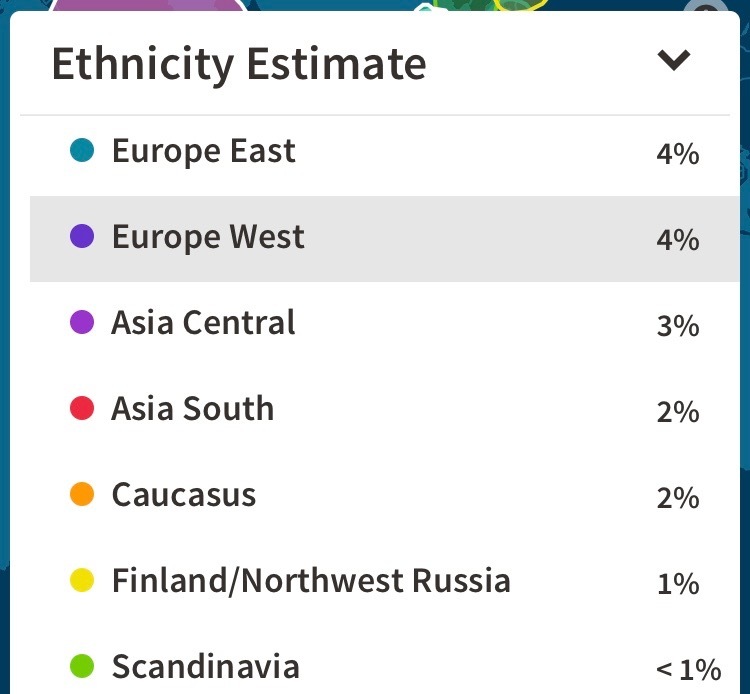 I was very surprised with my results. I did not anticipate so much of my DNA to be from Great Britain! 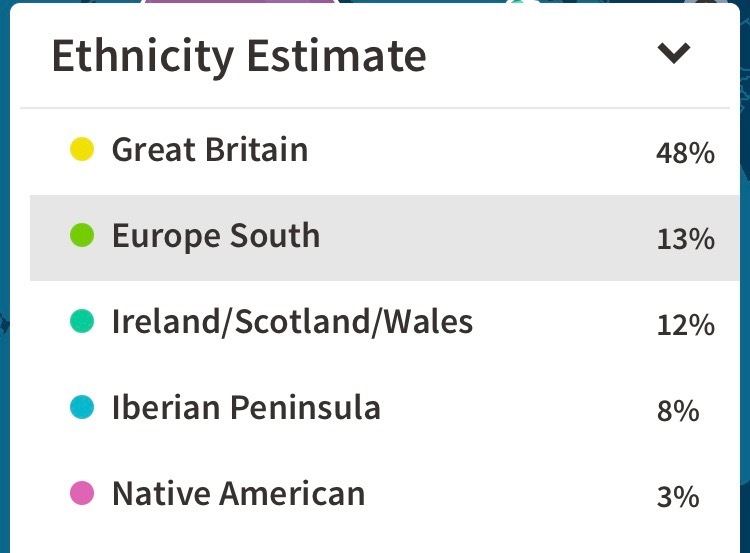 It also showed way less Spanish ancestry than I expected. There was also very little western Europe countries like France, Germany, and Switzerland. It was amazing to see how my research has been off. However, on further thought some makes sense when considering migration patterns and the history of these countries. About 16% of my DNA is a prediction. These are markers that are further in m family’s past. Therefore, it is less accurate or trackable. The amount of Middle Eastern, and central Asian is expected when considering that both Croatian and Spain have been under control of eastern countries. Although my results were surprising for me, it was such a easy and interesting experience. I would recommend the Ancestry DNA tests due to how easy it is to complete and receive results. 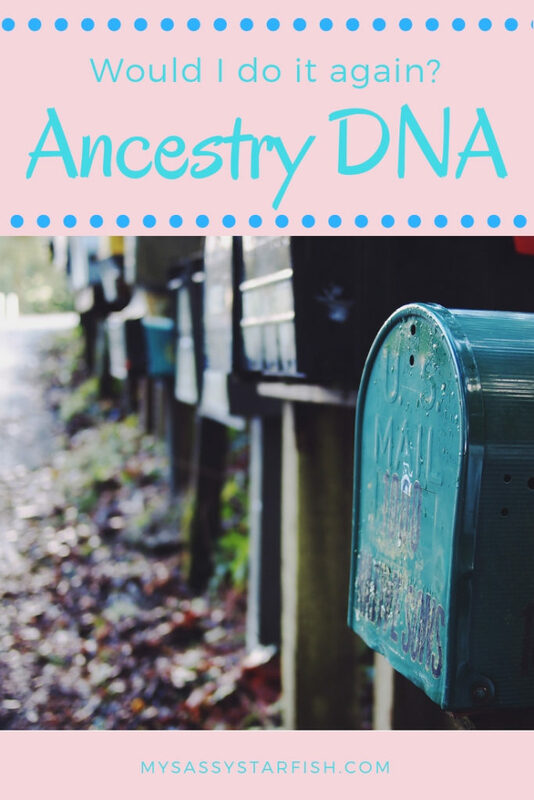 The whole process is sent through e-mail, and updates come in frequently from Ancestry. You also have the option to link your DNA with other people in order to see possible matches. (This can be waived if you would like your results to remain private.) My great uncle showed as my first match, and I see this as a good sign of consistency within the test. Ancestry uses genetic markers collected all over the world in order to predict your DNA. Some of these are guesses depending. Keep in mind that your family may be from other places, and migrated around. (For example: think of the Irish who left Ireland during the potato famine.) Also, other relatives are only part of your story. A uncle only gives you a small portion of possible DNA results. I look forward to using these results to guide further research by looking more carefully at last names and further into records.